Acme Markets has some really great deals each week! 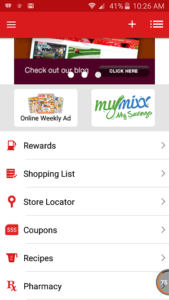 Make sure you sign-up for the MyMixx App and get coupons and savings right on your phone. Please make sure you review the Acme Coupon Policy before shopping. Acme Markets is a popular shopping store for everyday food and grocery items. It is also popular for discounting items which are regularly used, giving homes opportunities to save. Acme Markets accepts both manufacturer and store coupons. You can also print coupons off the internet and shop for big savings. Shopping with coupons at Acme Markets is pretty straightforward as their coupons policy is easy to understand and use while stacking coupons. Acme Markets will from time issue private manufacturer coupons which are redeemable at Acme Markets only. These coupons can be found in adverts on the website, coupon publications, and direct mail. They must be indicated “Manufacturer coupon” and show face value as well as expiry date. Manufacturer coupons that exceed the price of an item are adjusted downwards, for example, a $2.50 for a $2 item will be adjusted downwards to cover the $2. If you have a smartphone, you can download Acme Markets app for more savings. You will receive weekly savings offers as well as coupons. Acme Markets offers you personalized coupons depending on your shopping history. You can add these coupons to your MyMixx account. The App offers a smoother shopping experience as you can browse offers by recently added, category, aisle, about to expire, and your purchase history. You can redeem your coupons at the register by entering your phone number. You can use internet-printed coupons at Acme Markets. They must clearly show “Manufacturer Coupon”, have a serial number and show a valid manufacturer address. Internet printable coupons have a maximum value limit of $5 and only scanned at checkout. You cannot use internet-printed manufacturer coupon that offers a free product without requiring a purchase. A “Buy 1 Get 1 Free” coupon cannot be stacked with another coupon for two free items. All the rules for stacking that apply for manufacturer and store coupons will also apply for internet-printed coupons. Acme Market does not accept coupons presented electronically. These include barcodes on mobile phones or other electronic devices. Acme Markets offers special discounts for MyMixx account holders. You can use your MyMixx digital coupons at the register. How does this work? You download your digital coupon from MyMIxx and add to your account. When checking out, you use the Acme register PIN pad to redeem the coupon. Digital coupons have a time limit and must be used before this period elapses. You are limited to one digital manufacturer coupon from one MyMixx account per 1 item. Unfortunately, you cannot stack a digital and paper coupon on the same item. You also cannot double or triple digital coupons. If you have loaded a digital coupon electronically to your MyMixx account, it is automatically redeemed at checkout when you enter your MyMIxx details at the PIN pad. The coupon policies that apply to manufacturer and store coupons will apply here because this is just a digital version of these coupons. Acme Markets will not accept coupons that have been scanned, copied, photocopied, altered, traded, transferred or distributed. A coupon is only redeemable by the original holder. Any coupon that has undergone these transactions is declared null and void. Acme markets will also reject any suspicious coupon. It is good to note that the store manager reserves the right to alter coupon policy. He also has the right to limit quantities that can be purchased using redeemable coupons. Have you tried My Mixx? This is the Mobile Coupon App for Acme. Just clip the coupons right from your phone and they will be added to your loyalty card. No Physical Coupon Clipping. Also, they have a Rewards Program where you can save money at the Pump. It really doesn't get any better than that. Haven't signed up? Join Acme "My Mixx" Now! • ACME adheres to all manufacturer redemption guidelines. • No additional minimum purchase required for redemption of manufacturer’s coupons beyond what is stated on coupon. • Expired coupons will not be honored. • Customers must purchase exact product in specified size. • No substitutions are permitted on manufacturer-issued coupons. • Xeroxed manufacturer coupons are not accepted. • We will double the value of any manufacturer’s paper coupon valued 99 cents or less (i.e. 50 cent coupon will be doubled to $1.00; 99 cent coupon will be double to $1.98). • Coupons for $1.00 or more will be redeemed for face value. • Double coupon offer is valid on national brand manufacturer paper coupons only – unless otherwise noted. • ONE (1) manufacturer’s paper coupon and ONE (1) ACME store coupon may be redeemed on the same item, providing the value of the coupon is not more than the price of the item. However, only the manufacturer’s paper coupon will be doubled. • If the paper coupon’s face value or the double coupon value is greater than the purchase price of the item, the item will be free. We will not give cash back or apply additional discount. • The following paper coupons are redeemed at face value and are not doubled: o Free coupons, ACME store coupons, Milk coupons, Cigarette coupons, Pharmacy coupons, store-issued manufacturer paper coupons or manufacturer paper coupons that state “do not double”. • We accept computer (Internet) generated manufacturer-issued paper coupons that meet the following conditions: o Manufacturer internet printed coupons must clearly indicate that they are a manufacturer coupon and must have a valid manufacture address on the printed coupon. o Computer (Internet) generated paper coupons for FREE items require a purchase and must scan. Redemption value of FREE item not to exceed $5.00. o Internet coupons must have a scan bar and must follow an industry-standard format. o Internet printed coupons must be capable of scanning at checkout. o The same manufacturer and store coupon rules above apply to all internet printed coupons. o ** We do not accept coupons that have been identified as counterfeit and reserve the right to refuse any coupon that appears to be fraudulent. Coupons displaying signs of mass cutting or similar cuts and tears, coupons bearing tape, and coupons bearing sequential numbers may suggest coupon fraud. • Only one manufacturer coupon total will be applied to each “Buy One, Get One Free” offer. Coupons cannot be applied to the “FREE item. • We cannot refund the value of a coupon or return the coupon if a purchased item is later returned to the store. • Customers must pay any and all applicable taxes. The cash value of any ACME store coupon is 1/100¢. • We do not accept coupons or savings offers presented in the form of a bar code on a mobile phone or other mobile electronic device. • Coupons are non-transferable, and may not be copied, photocopied, scanned, altered, sold, traded, or otherwise distributed to others. Coupons that are copied, photocopied, scanned, altered, sold, traded, distributed or transferred by their original recipient to any other person, firm or group are VOID. • This Coupon policy may be modified at the Store Director’s discretion and is subject to change. • Computer (Internet) coupons that have been identified as counterfeit will not be accepted. • Rain checks are not issued for manufacturer paper coupons. • Rain checks can be issued for ACME store paper coupons as long as the coupon does not state “while supplies last”. • We reserve the right to limit quantities. To redeem any My MIxx digital coupons you must clip the offer and add it to your My Mixx account. You must use your MyMixx # at the ACME register pin pad to redeem electronically clipped digital coupons. All electronically clipped coupon offers must be used before the expiration date. All expired coupon offers will be removed from your My Mixx account. • Digital Coupons are not doubled or tripled. • Digital coupons may not be combined with a paper coupon on the same item. • Limited to one (1) MyMixx Mfg coupon per MyMixx account # per item. • Digital coupons that have been electronically loaded to a MyMixx # are automatically redeemed at the time of purchase after the MyMixx # has been entered at the pinpad. • All other coupon policies above apply to electronic coupons that are loaded to a MyMixx #. • Internet and digital coupons electronically loaded to a MyMixx # may not be doubled or tripled or other increase in coupon value promotion. • Acme Markets does not allow a customer to redeem two or more manufacturer coupons against the same item in a single transaction. • Coupon stacking policies for manufacturer coupons apply to paper and electronic coupons that have been loaded to a MyMixx #. Angel Soft Bath Tissue, Only $0.33 per roll at Acme, Today Only! Sparkle Paper Towels Only $0.63 per roll at Acme, Today Only! Digiorno Pizza Only $3.99 at Acme (4 Days Only)! Maruchan Yakisoba Noodles Only $0.20 each at Acme, Ends 9/20! Arm & Hammer Liquid Laundry Detergent Just $1.88 at Acme, ends 9/17! Acme ~ Jennie-O Ground Turkey Family Pack Only $5.00, Today Only! Arrid or Arm & Hammer Deodorant Only $1.00, ends 9/20! Pampers Swaddlers Diapers Only $8.99 at Acme, Ends 9/20! Xtra Liquid Laundry Detergent ONLY $1.88 at Acme, ends 9/17! Acme ~ SoftSoap Liquid Hand Soap, only $0.88, ends 9/6!! Acme ~ *4 Day Sale* – Turkey Hill Ice Cream only $1.99, ends 9/3! Acme ~ Marcal Bath Tissue Just $0.25 per roll, ends 9/6! Acme ~ Arrid or Arm & Hammer Deodorant only $0.88, ends 9/6! Acme ~ Cool Whip Whipped Topping only $1.00, ends 9/6! Acme ~ Angel Soft Bath Tissue, Only $0.33 per roll, ends 5/3! Acme ~ Sparkle Paper Towels only $0.67 per roll, ends 5/3! Acme ~ Nabisco Chips Ahoy! Cookies only $1.88, ends 4/30! Acme ~ Arm & Hammer Liquid Detergent only $1.88, ends 4/30!? Acme ~ Xtra Liquid Laundry Detergent only $1.88, ends 4/30! Acme ~ Scott Paper Towels only $0.58 per roll, Today Only! Acme ~ Digiorno Pizza’s only $3.88 (4 Days Only)! Acme ~ FREE Chobani Greek Flip Yogurt, ends 4/23! Acme Markets *New Home Delivery*, Get $10 Off + Free Delivery! Acme ~ Frosted Flakes or Lucky Charms Cereals only, $1.25, ends 3/15! Acme ~ Arm & Hammer Laundry Detergent, Only $1.99, ends 3/15! Acme ~ Jolly Time Microwave Popcorn only $0.50, ends 3/15! Acme ~ Post Breakfast Cereals only $1.24, ends 3/15! ? Acme ~ Ziploc Containers only $2.00, ends 3/1! Acme ~ Airborne Cold Relief Tablets only $4.99, ends 3/1! Acme ~ Angel Soft Bath Tissue, Only $0.33 per roll, ends 3/1! Acme ~ Sparkle Paper Towels only $0.49 per roll, ends 3/1! Acme ~ Signature Select Pizza only $3.99, ends 3/1! Acme ~ Huggies Jumbo Pack Diapers, only $7.99! Acme ~ Nabisco Chips Ahoy! Cookies only $1.88, ends 2/26! Acme ~ Xtra Liquid Laundry Detergent only $1.69, ends 2/26! Acme ~ Tuttorosso Pasta Sauce only $0.48, ends 2/26! ? Acme ~ Barilla Pasta only $0.63, ends 2/26! ? Acme ~ Yoplait Yogurts only $0.40, ends 3/1! ? Acme ~ Kleenex Facial Tissues just $0.75, ends 3/1! Acme ~ Brawny Paper Towels 6-Pack, Only $0.74 per roll, ends 2/22! Acme ~ Digiorno Pizza’s only $3.49 (4 Days Only)! Acme ~ Grab Nabisco Oreo Cookies for only $1.99, ends 2/22! Acme ~ Breyers Ice Cream Only $1.99, ends 2/22! Acme ~ SoftSoap Body Wash just $2.49, ends 2/15! Acme ~ Snuggle Liquid Fabric Softner only $0.99, ends 2/15! Acme ~ Frigo String Chesse only $1.99, ends 2/15! Acme ~ $0.73 Oui Yogurt by Yoplait, ends 2/15! Acme ~ General Mills Breakfast Cereals only, $1.24! Acme ~ Pepperidge Farm Cookies only $1.88, ends 2/15! Acme ~ Post Breakfast Cereals only $1.00, ends 2/15! ? Acme ~ Hellmann’s Mayo only $1.49, ends 1/29! Acme ~ Arrid or Arm & Hammer Deodorant only $1.00, ends 2/1! Acme ~ Eggland’s Best Eggs only $0.99, ends 2/1! Acme ~ Progresso Soups only $0.50, ends 1/29! Acme ~ Signature Select Coffee only $0.24 per pod, ends 1/29! Acme ~ Turkey Hill Ice Cream only $1.99, ends 1/29! Acme ~ Tuttorosso Pasta Sauce only $0.60, ends 2/1! ? Acme ~ Kleenex Facial Tissues just $0.90, ends 1/18! Acme ~ Scott Paper Towels only $0.99 per roll, ends 1/18! Acme ~ Scotties Facial Tissues only $0.66, ends 1/18! Acme ~ Jolly Time Microwave Popcorn only $1.00, ends 1/18! Acme ~ Nabisco Chips Ahoy Cookies only $1.61, ends 1/18! Acme ~ Arrid or Arm & Hammer Deodorant only $1.00, ends 1/18! Acme ~ Signature Home Windshield Wash only $1.50, ends 1/18! Acme ~ San Giorgio Pasta only $0.66, ends 1/18! Acme ~ Jennie-O Ground Turkey only $1.88, ends 1/18! Acme ~ Signature Select Pizza only $3.99, ends 1/18! Acme ~ Kelloggs Breakfast Cereals only $1.00, ends 1/18! Acme ~ Refreshe Bottled Water 24pk only $0.08 per Bottle, ends 1/15! Acme~ Maxwell House Coffee only $1.99, ends 1/15! Acme ~ Xtra Liquid Laundry Detergent only $1.49, ends 1/15! Acme ~ Ragu Pasta Sauce only $0.36, ends 1/15! ? Acme ~ Kraft Macaroni & Cheese only $0.77, ends 1/18! Acme ~ Women’s & Men’s Bic Razors only $2.69!? Acme ~ FREE Febreeze Air Freshners! ? Acme ~ Hot or Lean Pockets, only $0.99! Acme ~ Digiorno Pizza’s only $3.99 (4 Days Only)! Acme ~ Progresso Soup, Just $0.67! Acme ~ $0.50 Puffs Facial Tissues! ? Acme ~ $0.77 Kraft Macaroni & Cheese! Acme ~ Lysol Disinfectant Wipes or Bowl Cleaner only $0.59!? Acme ~ ? Stock-up on Gushers, Fruit by the Foot for only $0.77! Acme ~ General Mills Cereals only, $0.77! ? Acme ~ Print Now! Bic Razors only $2.69!? Acme ~ Airborne Cold Relief Tablets only $4.99! Acme ~ Huggies Jumbo Pack Diapers, only $6.99! Acme ~ New Years Eve Paper Party Goods only $1.00! Acme ~ Hefty Slider Bags only $1.50! Acme ~ Refreshe Bottled Water 24pk only $0.08 per Bottle! Acme ~ Tuttorosso Pasta Sauce only $0.63! ? Acme ~ $0.75 Campbells Chunky Soup!? Acme~ Ronzoni Pasta only $0.49! ? Acme ~ Tuttorosso Tomatoes only $0.24! ? Acme ~ Pillsbury Crescent, Grands or Cinnamon Rolls only $0.50! ? Acme ~ SoftSoap Liquid Hand Soap, only $1.00! Acme ~ Luzerne Ice Cream Sandwiches only $1.88! Acme ~ Poland Spring Water 24pk only $2.96! Acme ~ $1.39 Kelloggs Breakfast Cereals! Acme ~ Green Giant Frozen Vegetables, only $0.88! Acme ~ Del Monte Vegetables, only $0.49! Acme ~ Turkey Hill Ice Cream, only $1.88! Acme ~ Deer Park Water 24pk only $2.66! Acme ~ Cool Whip only $1.00! Acme ~ Ragu Pasta Sauce only $1.00! Acme ~ Mrs. Smith’s Flaky Crust Pies only $2.49! Acme ~ Digiorno Pizza’s only $3.97! Acme ~ Barilla Pasta only $1.00! Acme ~ Coupon Deals Matchups 12/15-12/21! Acme ~ ? Bic Razors only $2.99? Acme ~ $4.00 Viva or Cottonelle Toilet Paper! Acme ~ $0.99 Snuggle Dryer Sheets! Acme ~ $0.86 Kellogg’s Cereals! Acme ~ Hot! Stock-up on $1.00 Gushers, Fruit by the Foot & More!